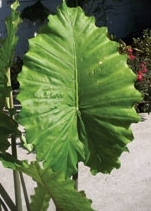 Elephant Ear bulbs are available from mid February . These bulbs are hardy in zone 7 and are available in 3 varieties. The Giant Upright “Alocasia odora”, the old fashion heirloom variety “Colocasia eculenta” and the large “Colocasia Jack’s Giant” (pictured below) is named after our own Jack deVroomen. The most popular size in the Upright bulb is large 11/13″. The most popular size in Jack’s Giant is softball size 11/13″. Other quantities are available, call the office 1 800 999 0567 for availability. Can the bulbs be raised indoors in the winter in zone 5? Are they pot worthy or do they need to be in the ground? Yes all of them can be grown indoors but some of them get very big! Is it too late to order Colocasia bulbs/Plants?